Make sure the turmeric supplement or curcumin supplement or spice you use passed our review and is right for you! Turmeric and its key compound, curcumin, may be helpful in treating inflammation and conditions such as depression, diabetes, and indigestion. 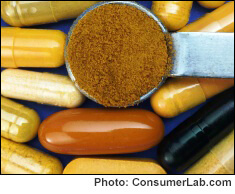 However, supplements on the market vary widely in the amounts of key curcumin compounds they contain, and some formulations may be better absorbed than others. Which are the best turmeric and curcumin supplements, and which don't measure up? To find out, ConsumerLab.com purchased and tested many popular turmeric/curcumin supplements. The tests showed that two products contained only about 50% of the curcumin compounds which CL expected based on their labels. Supplements which passed testing were then compared on cost (ranging from 20 cents to over $8.00 for equal amounts of curcumin compounds), and ConsumerLab.com then arrived at its Top Picks Among Supplements. Bottles of ground turmeric spice were also tested for possible contamination with heavy metals (lead, cadmium and arsenic) and filth. Three turmeric spices failed for filth — each having numbers of insect parts ConsumerLab considers unacceptable. Those that passed were then compared on cost and ConsumerLab.com chose its Top Pick Among Spices. You must be a member to get the full test results along with ConsumerLab.com's recommendations and quality ratings for turmeric and curcumin products. You will get results for 11 turmeric/curcumin supplements selected for testing by ConsumerLab.com as well as for nine others which passed the same testing in CL's voluntary Quality Certification Program. You will also get results for five popular turmeric spices used for cooking. How the bioavailability of curcumin may be enhanced with ingredients such as black pepper extract (Bioperine), CurcuWin, Meriva and BMC-95... and how to increase absorption of curcumin even without an enhanced formula! (4/14/17): ConsumerLab.com was contacted by an attorney representing one of the companies with a product that was designated "Not Approved" in this Review. The attorney demanded that information about the product be removed from the Review, asserting that CL "misunderstood" the product and that its methods were "flawed." CL disagrees with these assertions. Information about the product remains in the Review. For more information, see the Update posted near the top of the full Review.